Aristotle started to collect books in order to form his personal library even before he became a member of the Academy and a pupil of Plato (367 BCE). The kernel of his collection consisted in the texts of his father Nicomachus and medical treatises which the latter, who was physician to Amyntas III of Macedonia, probably had in his possession. Aristotle’s own writings, the exoteric together with the didactic, cover 106 papyrus rolls. In order to comment on the whole of the cultural tradition, he also collected all written texts accessible to him at the time: treatises on physics, philosophy, poetry, rhetorics, theory of government and politics, cosmogony, the diatribes of the sophists and all the works of Plato and the members of the Academy. His knowledge of the written tradition is evident from the numerous citations he uses in his texts and his critical comments on the works of other authors. There are three discernible periods in Aristotle’s writing, which correspond to the three stages in his life in which he made major additions to his library: the period of the Academy (c. 367-347), the period of his self-imposed exile to Assus, Lesbos and Macedonia (c. 347 – 335) and the time when he taught at the Lyceum of Athens (c. 335-322). His library, comprised of all these books, came to form part of the Lyceum library, and remained intact until Theophrastus’s death. 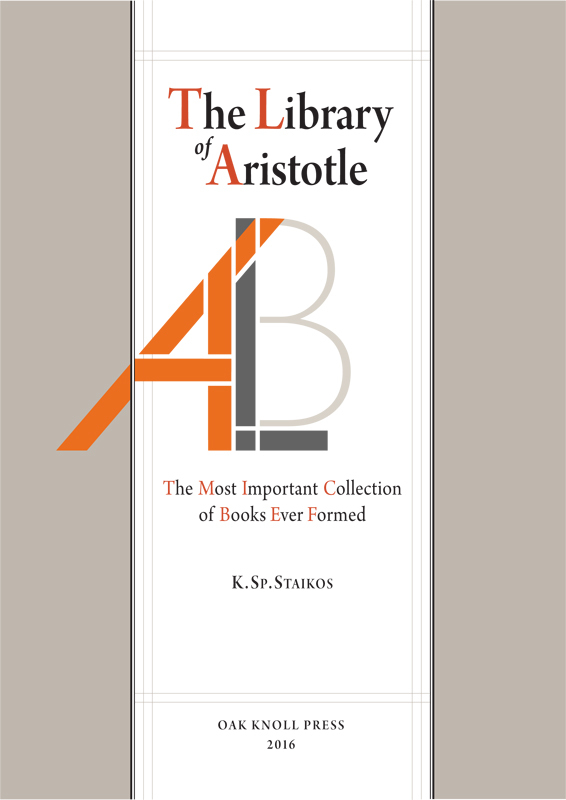 Aristotle’s Library follows the adventures of Aristotle’s book collection down to the edition of the corpus aristotelicum by Andronicus of Rhodes in the first century CE. No one before or after Aristotle was able to master such an complex and varied range of material, which covered nearly all branches of knowledge.